So it's another Valentine's Day and this year Direct2florist are proud to present a brand new range of flowers and bouquets to choose from. 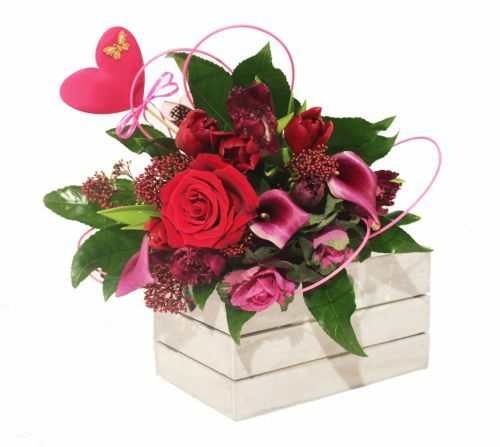 Vase arrangements, trendy box arrangements - each of these floral gifts are sure to delight the recipient. Okay - so as the saying goes Diamonds are a girls best friend. But if your pockets aren't that deep here are three sound ideas for Valentines that are sure to push the right buttons. 1. Night Away / Weekend Away - our girls agree a night away for Valentines is the best. BUT thinking of a restaurant on your night away - be careful to look for somewhere that is NOT packed to the rafters. 2. Perfume / Chocs / Lingerie - any of these or all three! make a splendid Valentine's day gift. 3. Flowers. Send her a gorgeous bouquet of flowers for Valentine's Day hand delivered by the local florist for maximum effect. Top tip - have them sent to her workplace and make her the envy of the office!